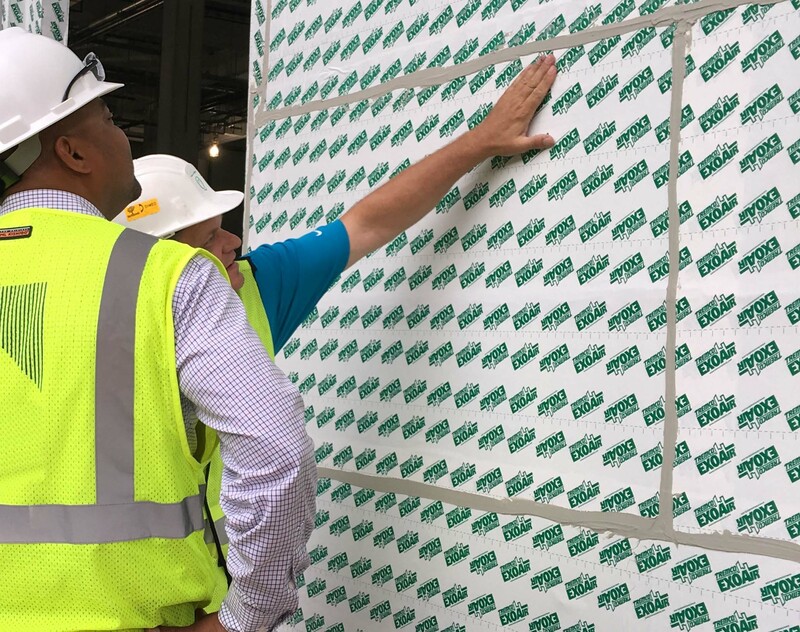 When specifying air barriers, it is advisable to bypass gaps allowing air and moisture in by choosing tested systems with protection for critical connections, adjacent systems, and transitions. Tremco offers a comprehensive line of ExoAir® air barrier membranes, sealants, and engineered transition assemblies. Tremco’s products have passed the National Fire Protection Association (NFPA) 285, Standard Fire Test Method for Evaluation of Fire Propagation Characteristics of Exterior Wall Assemblies Containing Combustible Components, and received an Underwriters Laboratories (UL) Safety Certification. 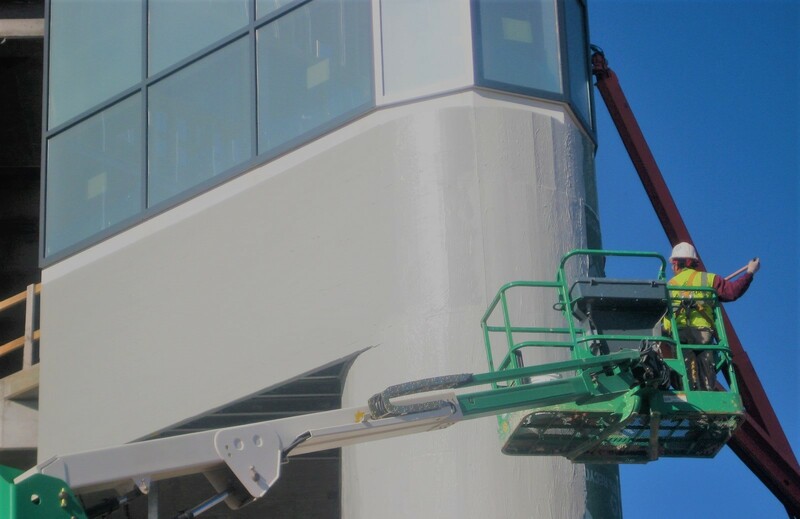 ExoAir 110AT is an impermeable, ultraviolet (UV)-resistant, self-adhered sheet designed to be applied to exterior cavity walls to mitigate air infiltration/exfiltration, vapor transmission, and water penetration. The membrane can be used is an air barrier assembly as well as a transition material. It is lightweight for ease of installation. ExoAir 230 is a permeable, UV-resistant, liquid-applied membrane formulated to retard the migration of air and bulk water while permitting water vapor to pass through, thereby resulting in greater flexibility of the air barrier membrane placement within the wall design. The membrane is typically applied to exterior sheathing panels, concrete block, poured concrete, or wood substrates and is designed for high temperature resistance. Using the acronym ‘WRB’ is common, but the intended meaning is often misunderstood, as it can refer to either a ‘water’ or ‘weather’-resistive barrier, with the two having different performance expectations. Plaza decks suffer from an identity crisis. They have multiple definitions and names—are they roofs? Floors? Driveways? Courtyards? Vegetative decks? Located over parking areas, arcades, or water storage reservoirs, they may be large (the size of a city block) or small (just a square meter or two). The Construction Specifier’s series of sponsored e-books continues with an exploration of the capabilities of steel in construction. The welcome center at Florida’s Port Canaveral space shuttle facility is Exploration Tower. Clad in aluminum panels and a curtain wall assembly, it is also the first major project to be finished with paint that changes color depending on the light reflectance. The building envelope’s fundamental purpose is to offer protection from the elements, providing comfort and safety to occupants within. However, in the quest for improved performance and innovation, additional roles and requirements have arisen.